Cortez Sims is arraigned via remote video in Judge Tom Greenholtz's courtroom in the Chattanooga-Hamilton County Courts Building on Friday, April 27, 2018, in Chattanooga, Tenn. Forty-five of the alleged Athens Park Blood gang members indicted last month on RICO charges were arraigned Friday. 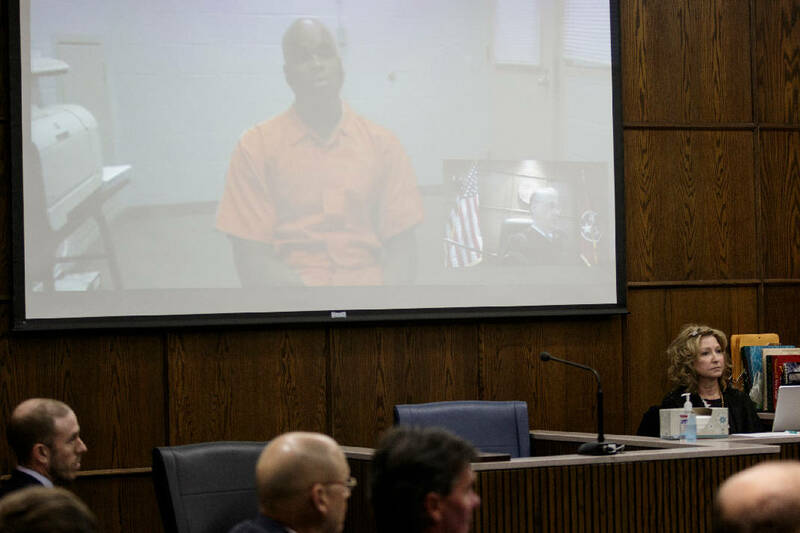 Cortez Sims may have shot and killed a 14-year-old boy during a gang feud in 2014, but unless prosecutors can prove he gained financially from the alleged crime, Sims' defense attorneys say he shouldn't be tried for it under Tennessee's racketeering law. Hamilton County's top prosecutor, Neal Pinkston, used that law for the first time in March to charge 54 people with conspiring to commit crimes for the Athens Park Bloods. Pinkston says that street gang is responsible for killing a state's witness, burglarizing homes, starting fires, selling drugs and using ill-gotten proceeds to bail members out of jail. At a minimum, the 54 defendants face a Class B felony that carries 12 to 20 years in prison. Others, including Sims, face murder charges. But some defense attorneys say the law requires Pinkston to prove defendants had a financial gain for each alleged crime they committed for the gang. So far, he hasn't done that in the Sims case, attorneys Josh Weiss and John Cavett say. "Murders and attempted murders are committed for an almost infinite variety of reasons, but only rarely for financial gain," Weiss and Cavett wrote in a motion filed Tuesday in Hamilton County Criminal Court. "The [state's] presentment, devoid of any language at all that informs Sims of the factual allegations of financial gain, is constitutionally defective and therefore should be dismissed." 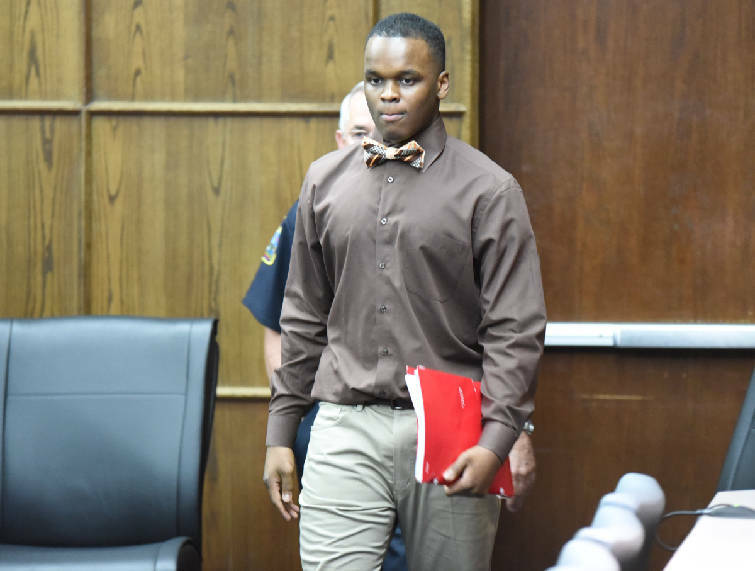 In this April 4, 2017, staff file photo, Cortez Sims walks into Judge Barry Steeleman's courtroom at the start of his trial. Pinkston's spokeswoman, Melydia Clewell, declined to comment Wednesday. But Weiss and Cavett pointed to the racketeering law, which legislators amended in 2012 to make it possible to prosecute street gangs. "The legislature specifically states, 'It is not the intent of the general assembly that isolated incidents of felony conduct be prosecuted under this part, but only an interrelated pattern of criminal activity, the motive or effect of which is to derive [financial] gain,'" they wrote in their motion. Last week, defense attorneys met at a local restaurant to discuss how the "financial gain" language applies to the state's case. Some, including Sims' lawyers, are expected to file motions to dismiss based on the racketeering law being unconstitutionally vague. In the meantime, defense attorneys want prosecutors to turn over evidence as soon as possible so they can figure out how their clients are connected to the gang. Though the state's 22-page presentment includes a number of criminal allegations, it doesn't say what crimes 44-or-so members committed for the gang. "Moreover, without a timely provided list of material witnesses, defense counsel cannot ascertain potential ethical conflicts of interest, which could further delay the defendant's right to a speedy trial," Chattanooga defense attorney Ben McGowan wrote in a recent motion. It's no mystery what Sims is accused of doing. Prosecutors say he was involved in the Jan. 21, 2014, slaying of Deontrey Southers, a 14-year-old who was shot through his front door when rival gang members came looking for his mother's boyfriend, Bobby Johnson. But who are the witnesses? That's one area Sims' defense attorneys are likely to probe. Sims, 21, is serving a life sentence for the 2015 murder of Talitha Bowman and the attempted murders of Marcell Christopher, Bianca Horton, and Horton's then-2-year-old child. Prosecutors said Sims opened fire inside of a College Hill Courts apartment because of a feud between the Athens Park Bloods and the Bounty Hunter Bloods. Christopher and Horton survived the shooting and testified against Sims in a pre-trial hearing. But in May 2016, Chattanooga police found Horton's body dumped on Elder Street and riddled with bullets. In their current racketeering case, prosecutors say Andre Grier, Courtney High and Charles Shelton kidnapped and killed Horton to prevent her from testifying against Sims at his 2017 trial. Contact staff writer Zack Peterson at zpeterson @timesfreepress.com or 423-757-634 7. Follow him on Twitter @zackpeterson918.